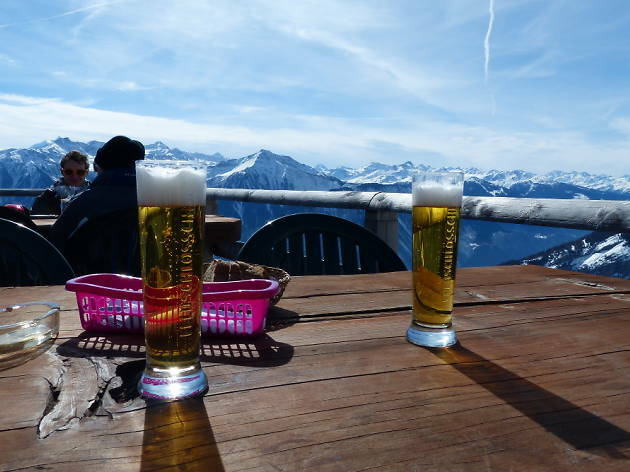 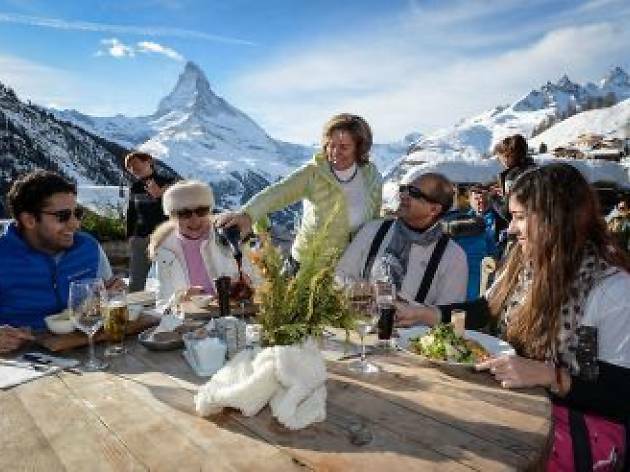 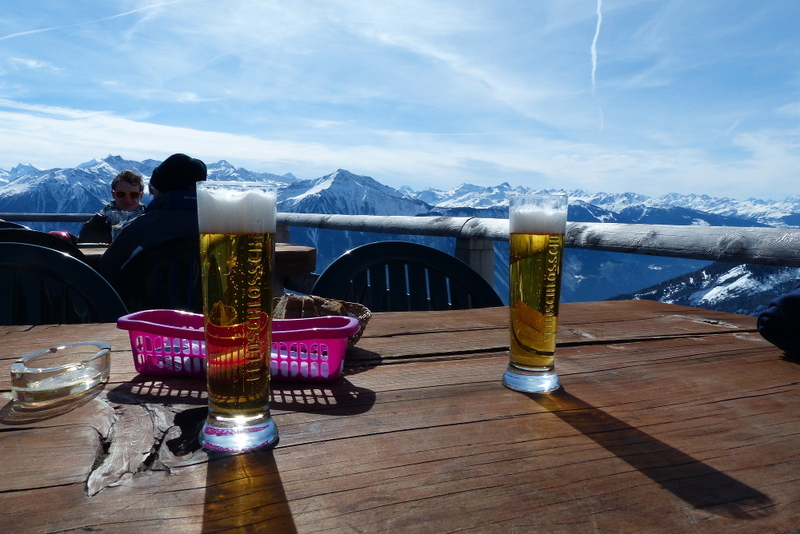 Whether it's apres-ski or just an apero, here are some top spots to enjoy some winter sun and stunning mountain views in Switzerland. 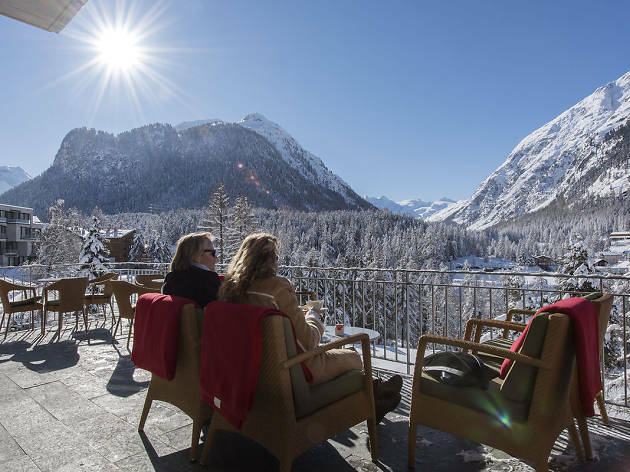 Take advantage of the crisp weather and incredible views from the sun terraces of these Alpine restaurants and cafes this winter. 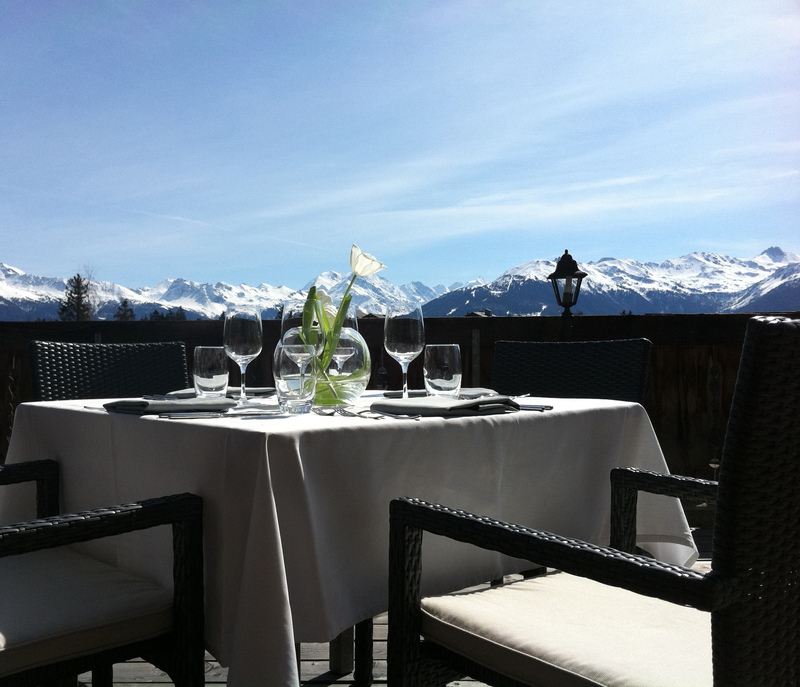 Food ranges from traditional to avant garde while the vistas are all Michelin-star standard. 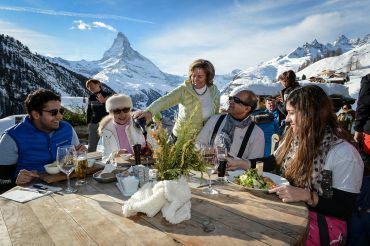 The stunning views, and stylish sun deck, are almost enough to make this one of the most fun restaurants in the country. 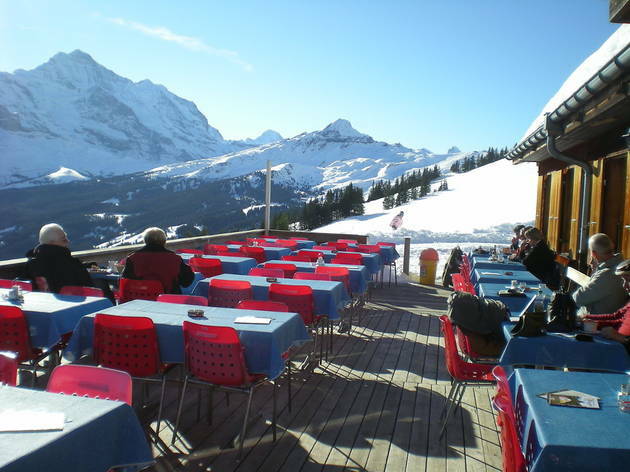 After spending a morning in the snow working up an appetite, there are few better places to end up for lunch than this mountain restaurant. Perched at 1,792m on the south-facing side of the Grindelwald valley, its sun-trap of a terrace overlooks the vast Eiger mountain on the opposite side. 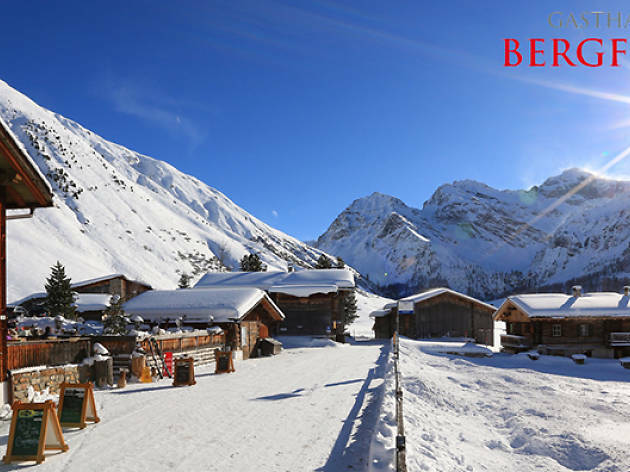 This rustic farmhouse-style hotel restaurant occupies an idyllic spot by Lac des Chavonnes, a short hike or ski from the Bretaye mountain rail station above Villars-sur-Ollon. 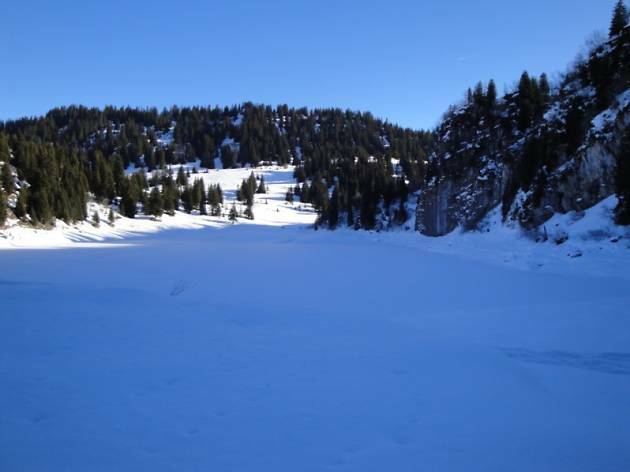 In winter it’s a short, flat skate from the bottom of the Chavonnes chair lift. 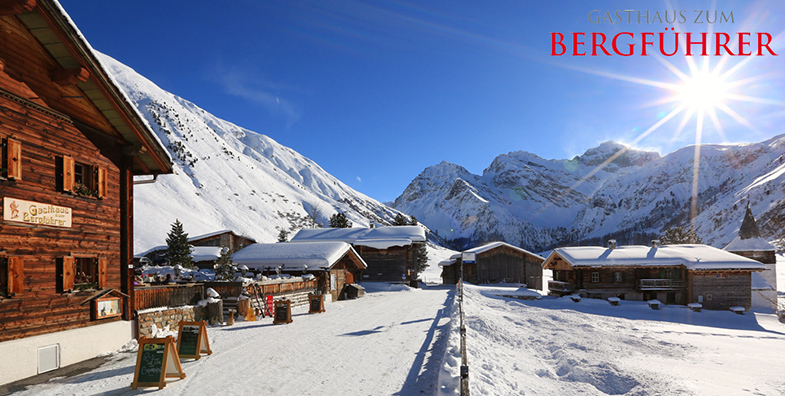 Whether you arrive by foot, skis or cable car, make sure you find your way to Bergrestaurant Spielboden. 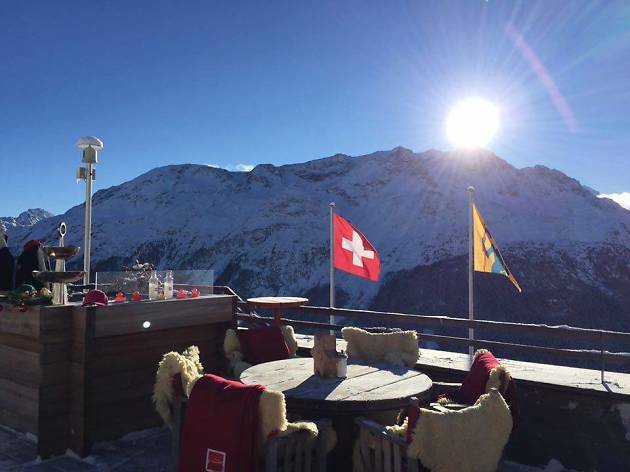 Located at 2,450 metres above sea level, the mountain restaurant overlooks the “Pearl of the Alps”, Saas-Fee, and a basin of 4,000-metre summits. 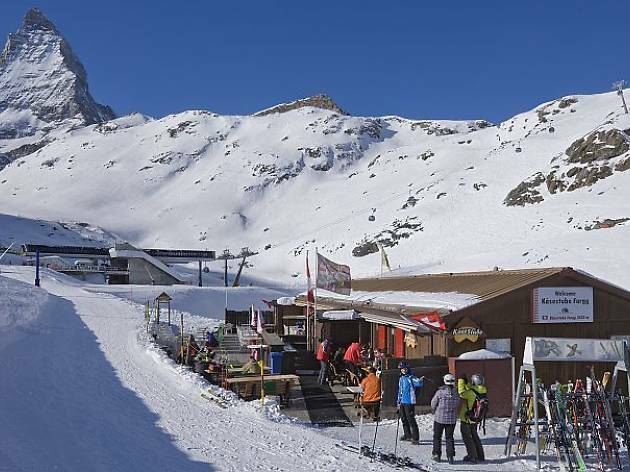 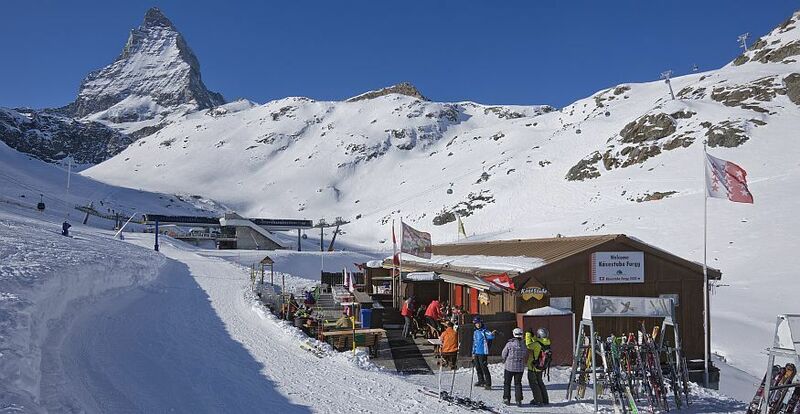 Located in the Torrent ski area near Leukerbad in the Valais alps, this family-run restaurant is a popular mid-ski lunch spot thanks to its glorious sunny terrace looking out over the peaks to the south. 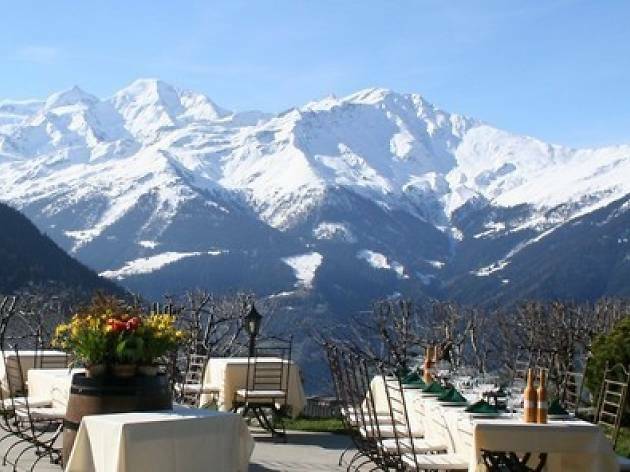 This Verbier hotel's terrace comes complete with grill facilities so you can enjoy freshly cooked meals at lunchtime with a side-serving of delicious mountain views. The Berghaus Diavolezza's sun terrace has stunning views across the Bernina Massif and Piz Palü. 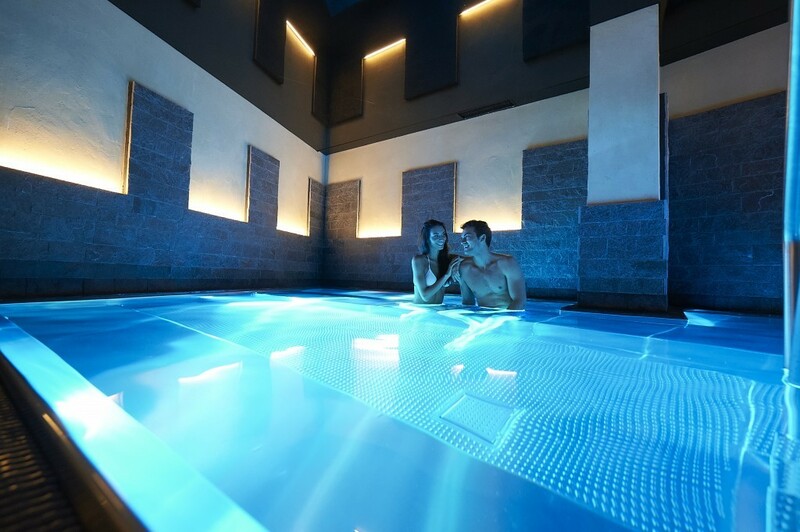 Even better, you can enjoy the scenery from the comfort of an open-air whirlpool jacuzzi! 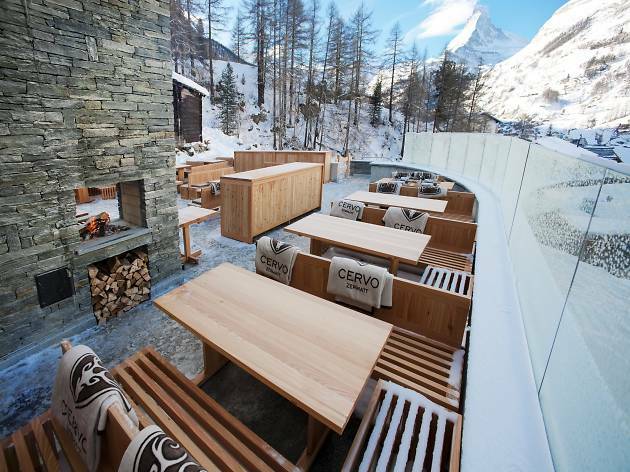 The Cervo's big sun terrace offers amazing views of the Matterhorn so it's no surprise to find most of Zermatt here after the slopes. 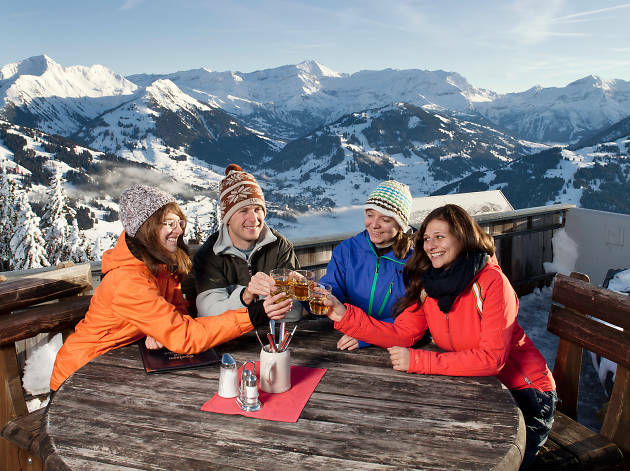 Tuck into some Alpine tapas and enjoy some live music too. 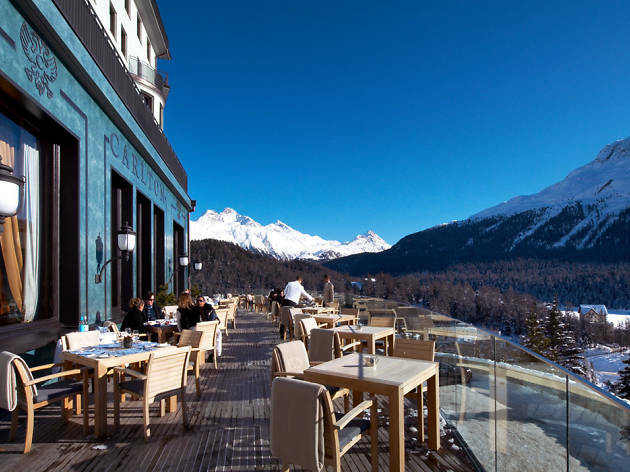 Hotel Saratz in the St Moritz area has two sun terraces with magnificent views in both winter and summer. 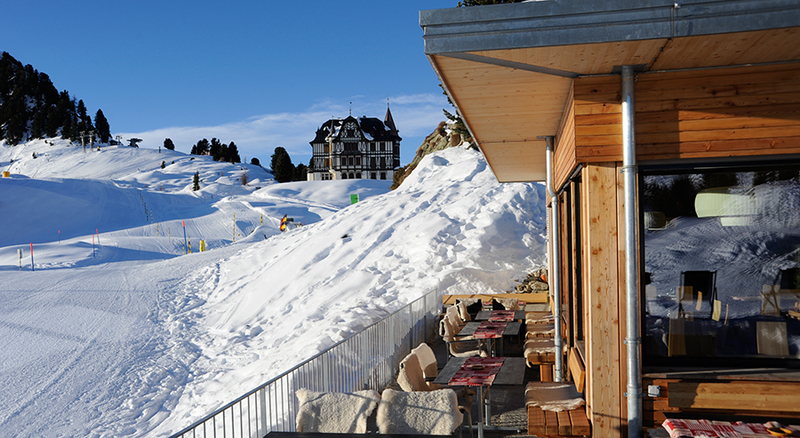 Eateries include the Art Nouveau restaurant, a cozy fireside bar and a fondue and raclette stübli situated in the hotel's historic vaults. 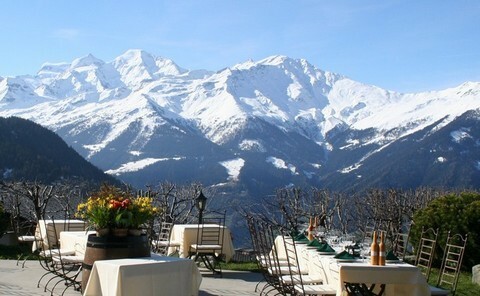 Enjoy some great views of the Riederalp and Aletsch plateau from this hotel's dining terrace. 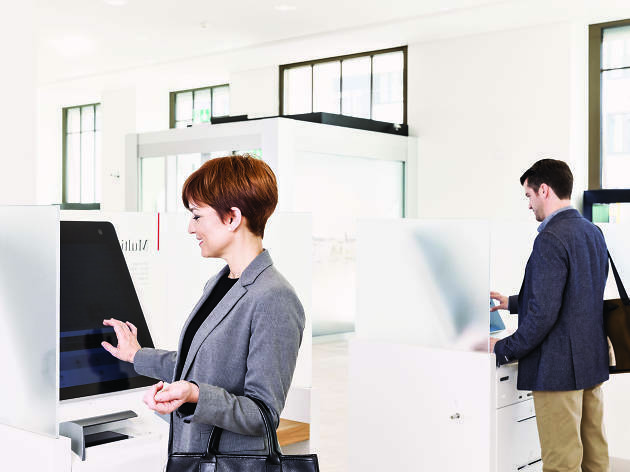 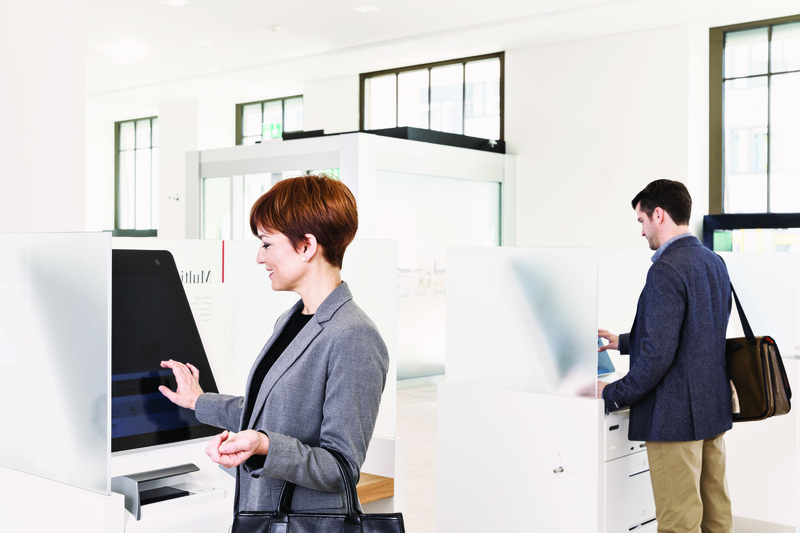 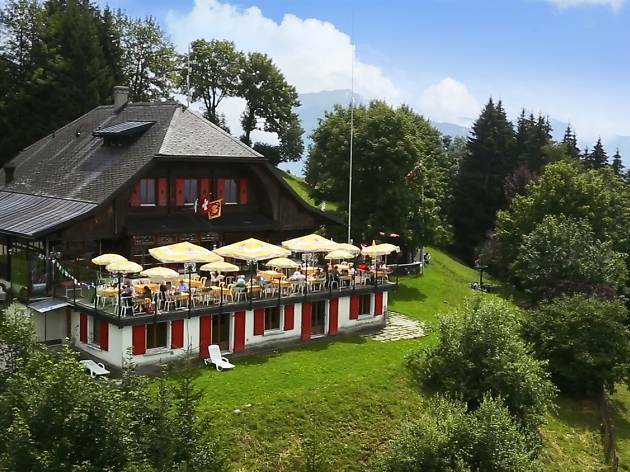 There are three eateries serving up meals ranging from traditional Valais dishes to burgers to self-service snacks. 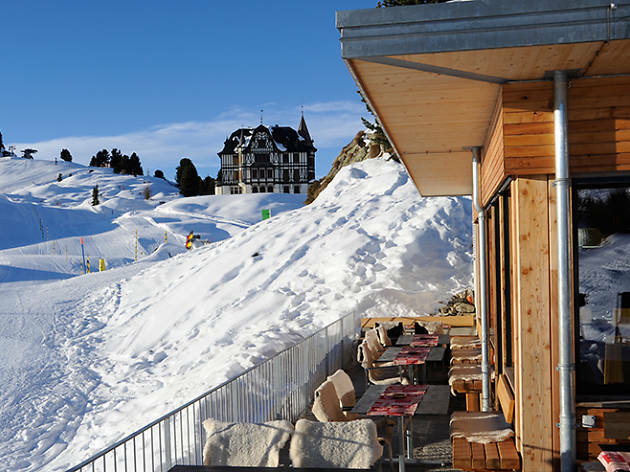 This traditional, chalet-style restaurant is the perfect place for a fondue, raclette or grilled cheese sandwich with some incredible views thrown in for free. 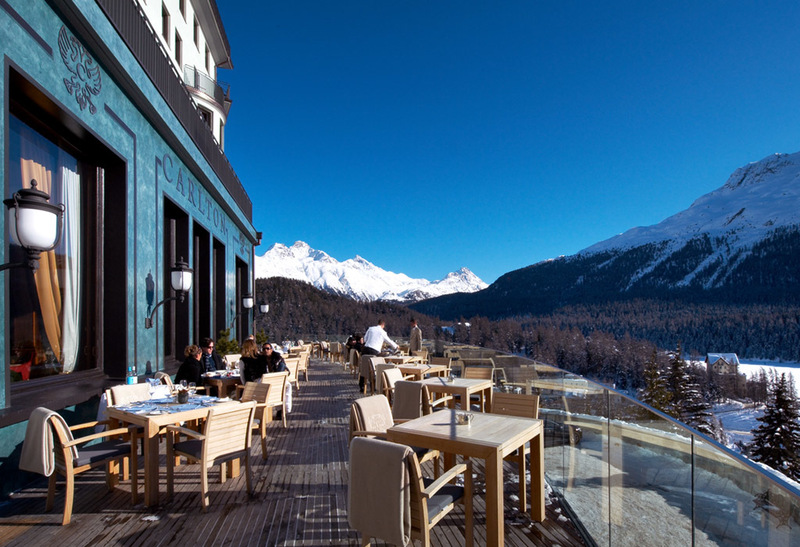 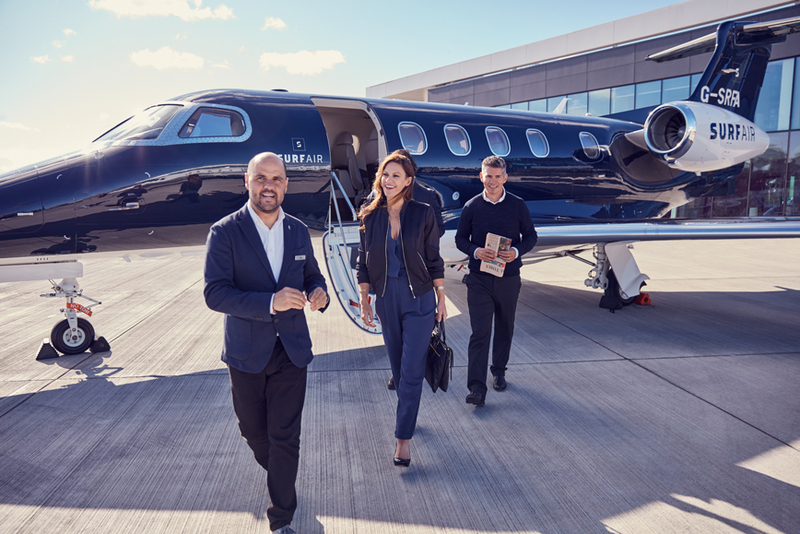 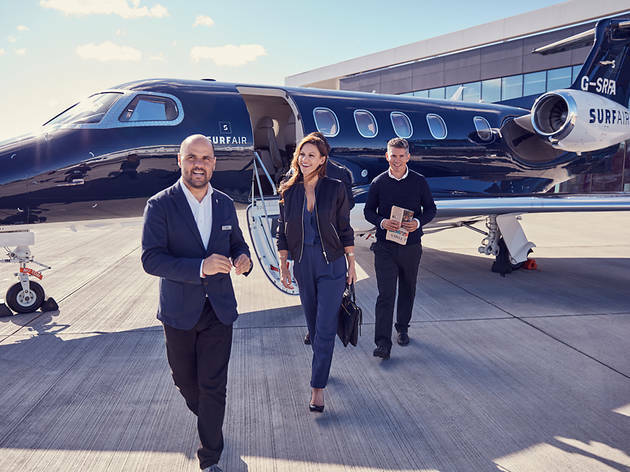 The Carlton Hotel stands out among its St Moritz neighbours, and not just because it’s the only hotel in the resort where each room is south facing with simply stunning views over the lake of St Moritz. 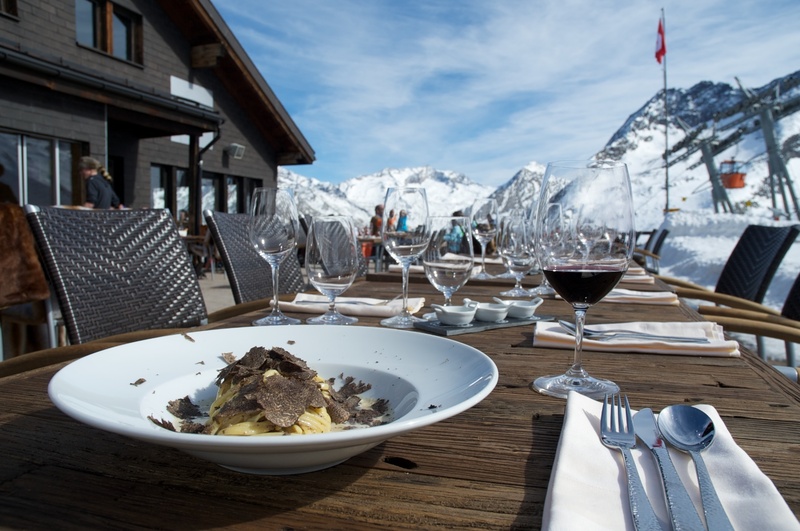 Situated 1,861 metres above sea level in the Sertigal mountains of Davos-Klosters, Zum Bergführer serves up hearty mountain fare from November to April. 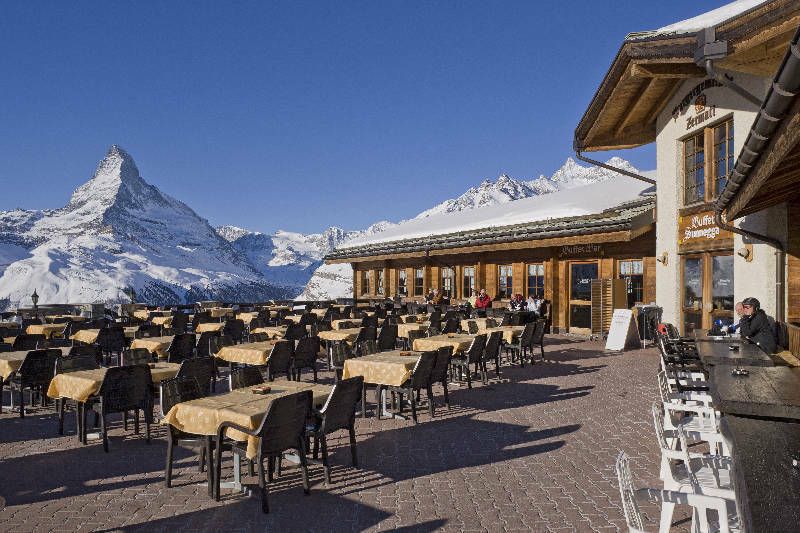 With 250 seats on the outdoor terrace, this is a fine spot to tuck into some chow while enjoying the spectacular scenery. 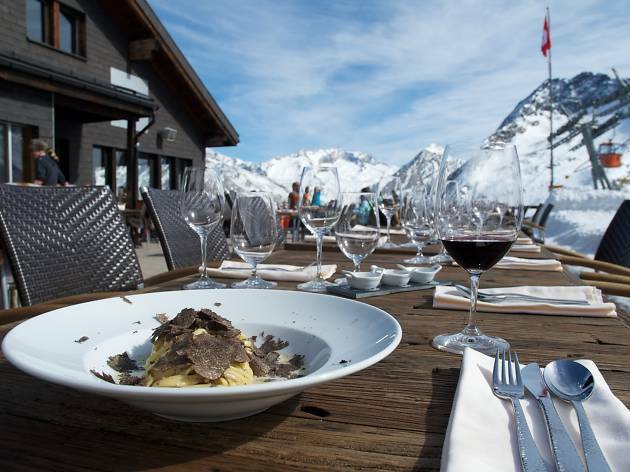 We reccomend the lunch package, which includes the dish of the day plus your cable car ticket up and back. 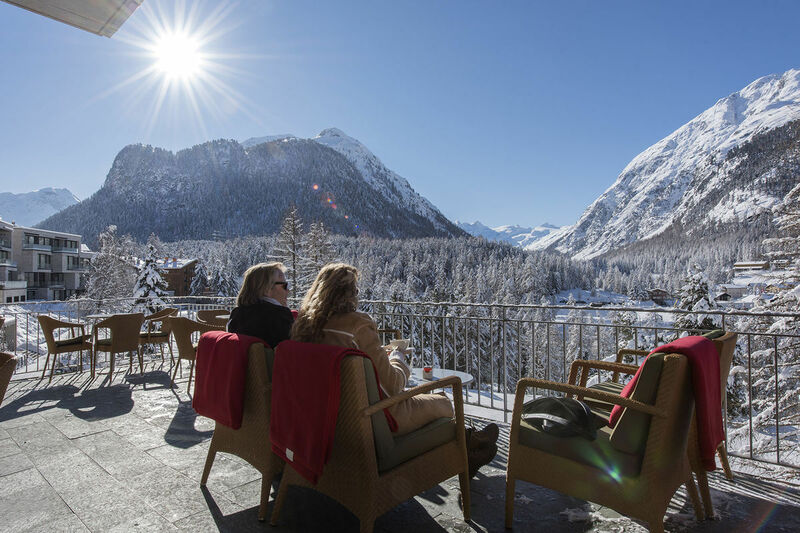 While the menu at Buffet Bar Sunnegga won’t blow you away – it is standard mountain fare – the views from its panoramic sun terrace are hard to beat. 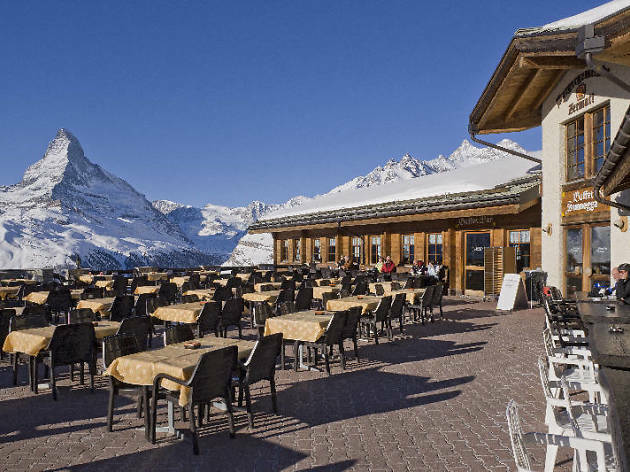 The self-service restaurant above Zermatt lays claim to one of the best angles of the Matterhorn. 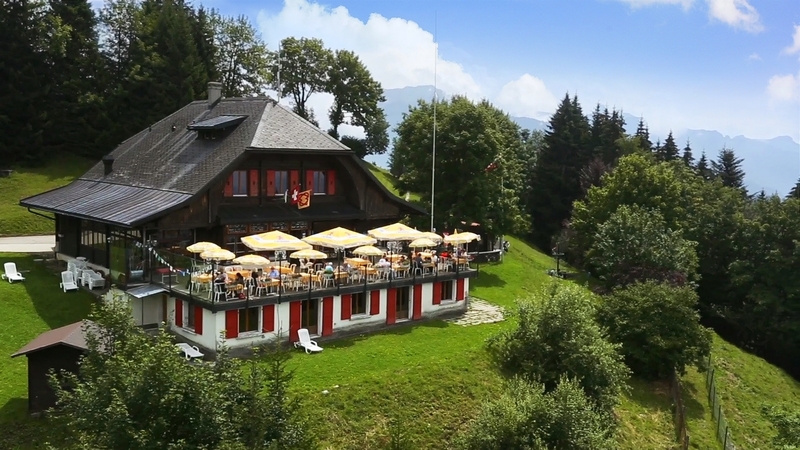 Located at the top station of Les Pléiades, this restaurant has one of the most beautiful views in the Lac Léman region, with a sunny terrace overlooking the lake and the mountains beyond. 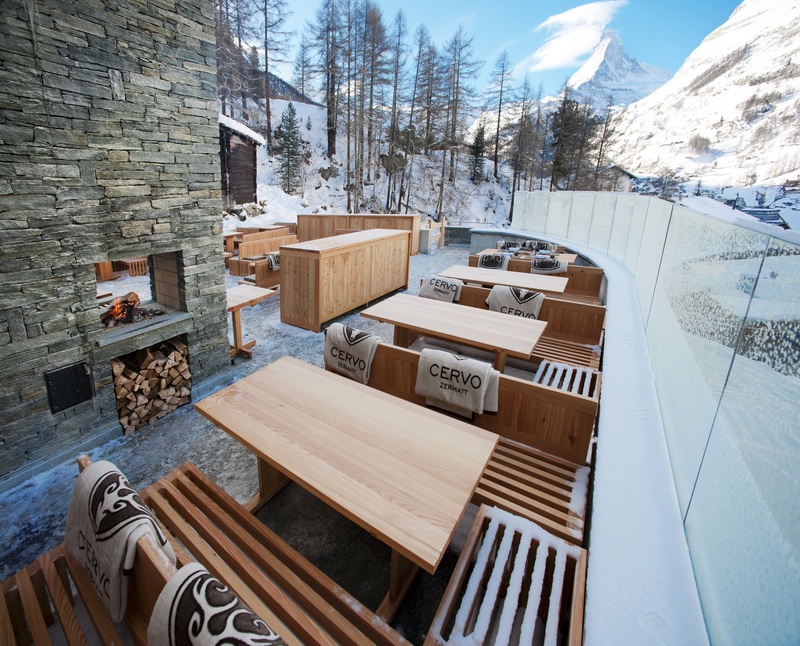 Chez Vrony offers a heady combination of tasty food using locally sourced ingredients and a stunning backdrop of views to the Matterhorn. 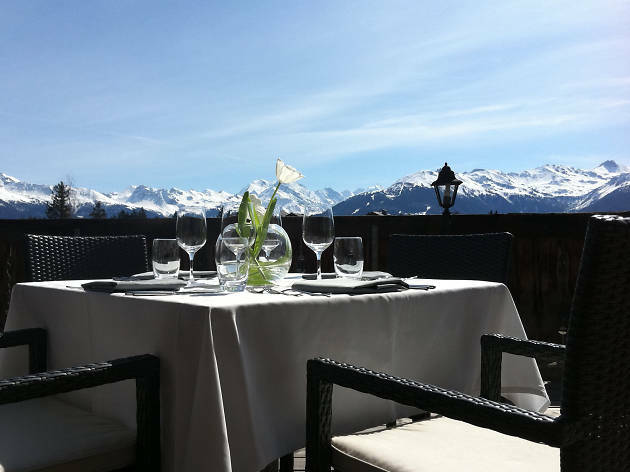 Enjoy high-end food and exquisite views from the terrace of Restaurant Gastronomique at this stylish mountain hotel in Crans Montana.